← Roleplaying…for a good cause! The Time Lords intercept the transmat beam from Earth to Nerva and strand the Doctor, Sarah Jane, and harry on the planet Skaro in an era before the Daleks evolved. Tom Baker is the Doctor in Genesis of the Daleks. We’re just going to get this moment out of the way right now because as silly as this scene is, it only serves to highlight just how amazing everything else is about Genesis of the Daleks. 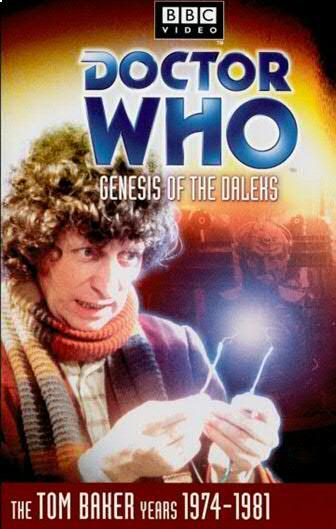 A serial that routinely appears on any list containing the words “best Doctor Who story ever,” Genesis clicks on every level – a cracker script by Terry Nation, nail biting cliffhangers, strong and memorable secondary characters including the introduction of one of Who’s iconic villains, and an iconic moment not just for the Fourth Doctor, but for any and all incarnations of the wayward Time Lord. In 1974, during their final days on Doctor Who, Terrance Dicks and Barry Letts commissioned a script from Terry Nation containing his creation, the Daleks. The script Nation submitted was familiar to Dicks and Letts…in fact, Nation had unwittingly sold them the very same script twice before, with the same concepts, themes, and plot points! After a good laugh between the three, Letts suggested something different, telling Nation “we’ve never seen the genesis of the Daleks.” Nation took his words to heart, calling his new submission Genesis of the Daleks. Nation’s script is one of the best ever produced in the entire history of the show. The Thousand Year War between the Thals and the Kaleds is portrayed as as a mix of World War One (gas masks, trenches, rifles), World War Two (both sides are totalitarian governments committed to total victory, with the Kaleds being Nazis in all but name per their black uniforms, fascist salute, and interest in genetics) and World War Three (a mismatch of equipment, low supplies, mutated creatures in the wasteland, and a ballistic missile bringing the last hope of victory). It’s an incredibly grim script, with two nations at the end of the civilized rope and spending their last days fashioning into a noose, with all the hand-wringing and false bravado that goes with it. Nation’s script avoids putting one side in the “white hat” and the other in the “black hat,” as both sides are capable of horrific acts, from the Kaled’s immoral experiments to the Thals using expendable slave labor to load their final rocket with a substance so lethal that just handling it for a few hours causes death. There are also a load of memorable secondary and tertiary characters, from the fanatically dedicated Kaled General Ravon (Guy Siner, best known for his part in ‘Allo ‘Allo!) to the scientist who finds his backbone Ronson (James Garbutt) to the leader of the rebellion Gharman (Dennis Chinnery) to the brave Muto Sevrin (Stephen Yardley, who also starred in Vengeance on Varos). Perhaps the most memorable of these characters is the Himmler-esque sneering, bespectacled Nyder, right hand man to Davros. Veteran actor of stage and screen Peter Miles (who also starred in The Silurians, Invasion of the Dinosaurs, and one of the first Big Finish audios, Whispers of Terror) channels the Nazi leader without any hint of camp; a rigid demeanor, cold attitude, and surprising charisma which he uses to convince his enemies to confide in him. The Sontaran Experiment was partially conceived by Philip Hinchcliffe as a way to save some money. There’s a damn good chance that money went into the production of Genesis of the Daleks because this is an absolutely gorgeous looking serial, even after 40+ years. The studio lighting by Duncan Brown is superb, helping to the various corridors look different as well as casting sinister shadows on the wall as the Daleks roll past. The lighting on the outdoor trenches, a green and purple sky that suggest sunset against a chemical sky, adds to the awe and terror of a group of patrolling Daleks. Director David Maloney also helps to make the Daleks look much more mobile and fluid in this serial. While there’s still the budgetary problem of three Daleks standing in for a whole army of them, Maloney shoots the Daleks from a low angle as they move, suggesting a sense of speed and determination as they roll through a scene. In every shot, they are the centerpiece, dominating the viewer’s field of vision as they stand motionless. Roy Skelton handles their voices, suggesting an alpha Dalek with a low tone, a beta Dalek with a neutral tone, and a delta Dalek with a high pitched tone as it screams to be noticed. Maloney’s directing helps to ensure that the six-part story doesn’t drag, keeping the story moving along. While there is some corridor running and some “capture/escape/repeat,” there’s little actual padding as the story moves from “military adventure” to “spy thriller” to “rise of rebellion” with ease. The cliffhangers as well are standouts, with my favorites being Sarah’s at the end of the second episode and Davros’ screaming at the end of the fourth one. The companions get plenty to do in Genesis of the Daleks as well. We get a lot of the Doctor and Harry pulling a double act through the first half of the story, and I once again find Ian Mater’s Royal Navy surgeon growing on me. He’s British through and through, never complaining, never showing his pain from having his ankle bitten by a giant clam, quick to grab a gun but not to fire it, coaxing Ronson to rebellion, and in one of my favorite moments of my Baker-watch so far, finding the guy to an armory locker while the Doctor bangs against in vain, handing it over to him without so much as a word or comment. The next story, Revenge of the Cybermen, is the one that cements Harry’s legacy as a bumbling imbecile, and based upon his performances in The Ark in Space, The Sontaran Experiment, and now this story it’s a damn shame. On the other side of the TARDIS, Sarah Jane gets a lot more to do in this story, bringing the Mutos to life in an attempt to escape from Thal captivity, quaking with fear when she sees a Dalek both in and out of its battle armor, and serving as the audience stand-in as she tries to convince the Doctor to end the Daleks before they can even begin. Elisabeth Sladen channels Sarah Jane’s fear of the Daleks, having seen them at their worst during her time with the Third Doctor in Death to the Daleks, to wonderful effect. The beginning of Genesis of the Daleks sees the same manic, devil-may-care Doctor that Tom Baker had wonderfully portrayed throughout three stories, from bantering with Harry over getting some refreshments from their captors (“no tea, Harry”) to breaking into the Thal dome to rescue Sarah Jane (“Excuse me, can you help me? I’m a spy.”). But when the Doctor believes Sarah Jane and Harry have died at the beginning of the fourth episode, all kidding around stops. Much like we saw the switch get flipped in The Sontaran Experiment, the back end of Genesis of the Daleks sees a determined Doctor, one who will do what he can to end the Dalek menace. But there’s a difference between stopping a Sontaran invasion and complete genocide. At the pivotal moment, when the Doctor has the very means to destroy the Daleks once and for all in his hands…he remembers just who he is. “Coward, any day,” the Ninth Doctor said when he had the same choice, a man who might do horrible things and cause people to die, but would never take their final step, absolute genocide. This is the Doctor, a man who even when things are at their worst and the chips are done, the ends can and will never justify the means. With Sarah Jane screaming at him to end things (and Harry wisely deciding to stay the hell out of this argument), Baker shows the anguish that the Doctor is feeling. A man who walks in eternity, he knows what the Daleks will do, but he also knows what their presence is capable of doing – uniting planets, species who would never otherwise ally, against them. Now, considering Nation has given us a creature without conscience, without pity, without mercy, it might seem that the choice is incredibly clear. But the Doctor lives and dies by that thin thread of hope, that even when the odds are one in a thousand, he will grab that thread and pull on it for all it’s worth. His relief when it turns out he doesn’t have to touch the wires together is a quiet moment of great acting from Tom Baker, understated because the Doctor is emotionally exhausted from the weight of the decision he almost had to make. Davros. For a very long time, the story of the Daleks became the story of Davros, as future appearances of the Daleks in the classic series would involve their creator as well. And there’s a reason for this, as Michael Wisher’s performance as Davros is absolutely incredible. Putting aside the top-notch make-up and costuming job by John Friedlander and Sylvia James to create and apply the Davros costume, Wisher is everything one expects in a villain; calculating, manipulative, and absolutely dedicated in his beliefs. Speaking from a fan of both comic books and professional wrestling, the best villains are the ones who believe they are completely in the right, that their actions and words are completely and utterly justified There’s a moment in the fifth episode where the Doctor asks Davros what he would do if he had absolute power over life and death. Davros’ response is one of the iconic moments in the show’s history. Wisher prepared for the part of Davros by rehearsing with a paper bag over his head to simulate the claustrophobia of the Davros mask. This allowed him to act solely through his voice, without worrying about any other facial expressions that might lead his performance into farce or camp. The performance Wisher gives as a result is chilling and terrifying. Even when speaking softly in an attempt (or a ruse) at being conciliatory or screaming for the same pity that he chose not to instill in his creations, there is an underlying menace to his words. There’s no coincidence that the Daleks sound like their creator, especially when he screams in anger. And you can’t forget his hand, scarred, misshapen, long fingernails pressing buttons and flipping switches in his own transport device, one that looks like the bottom half of a Dalek. Wisher just nails the performance, that’s really the best way to put it, and while this would be the only time Wisher portrayed Davros due to theater commitments, his turn in Genesis of the Daleks can be seen and heard in every other actor’s performance as the mad creator of the Daleks. Cygnia – I never hid behind my couch as a kid! The Daleks shouldn’t have worked as a bad guy. Go up a flight of stairs, duck under the plunger, threat averted! And yet, on the backdrop of a horrific world war, this was my introduction to the most iconic monster from Doctor Who. What a doozy. Even after all these years (giant mutant clams aside), it’s still a chilling tale. I don’t know how many times I saw it on repeat as a kid, but I can tell you my heart kept sinking EVERY TIME Sarah Jane tried to escape that climb up the rocket. You want to know why Sarah Jane freaked out during “The Stolen Earth” when she heard Davros? This story is why. She was there at the Daleks’ beginning and saw the full horror of what they would become. Weigh all of that between the Doctor’s (justifiably classic) “Do I have the right?” speech and Davros gleefully admitting he’d break open a capsule that would kill everyone in the universe. On a lighter note, scary as he was, I still wanted to flip all the switches and push all the buttons on Davros’ chair. Genesis of the Daleks is a grim story, one that drove moral guardian Mary Whitehouse up a wall as she referred to the episode as “teatime brutality for tots.” But there’s no denying this story’s impact on all of Doctor Who. Every aspect of this serial is superb, all coming together and clicking in a story with tension, moral dilemma, and a top notch villain, tied together by great directing and lightning. There’s a reason Genesis of the Daleks is remember so highly almost 40 years are its initial broadcast. It’s THAT good. – I make fun of it in the introduction, but the clam was described as “one of Davros’ failed experiments.” And now I want Daleks riding into battle strapped inside giant battle clams. – The Doctor just looks so broken after the Thal missile attack, when he believes Harry and Sarah Jane are dead. This helps to explain why he’s so eager to spill his guts to Davros later on when the scientist threatens to torture his companions unless he talks. – The Doctor tells Bettan, one of the surviving Thals, that she needs to put together a resistance to fight back against the Daleks. Foreshadowing of Davros’ comments in Journey’s End about how the Doctor takes his companions and transforms them into soldiers? – As Cygnia said, the chair was pretty freakin’ cool, wasn’t it? Cobi’s synopsis – Genesis of the Daleks is a story that deserves the sobriquet “classic.” A superb script, memorable secondary characters, and some smashing lighting work mix with the introduction of Davros, the return of the Daleks, and one of the Doctor’s greatest moral dilemmas. Tom Baker is the Doctor in…Revenge of the Cybermen. This entry was posted in Classic Doctor Who and tagged Classic Doctor Who, Classic Doctor Who Review, Daleks, Davros, Doctor Who, Doctor Who Review, Elisabeth Sladen, Fourth Doctor, Harry Sullivan, Ian Marter, Sarah Jane Smith, TARDIS, Tom Baker. Bookmark the permalink.